We discovered Roberts Park last weekend when we were invited to a private function held at the park. 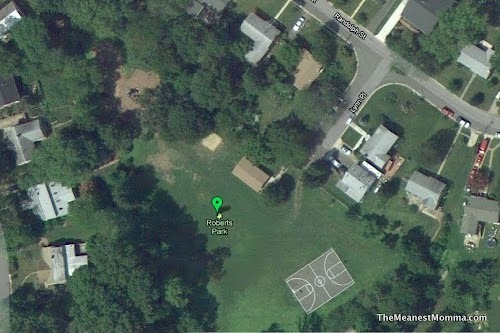 The park is tucked into a neighborhood off of S. West St and doesn’t have a parking lot or much in the way of signage. Entrance to the park is at the end of Lynn Place. However, once you find your way in, you’ll find a lovely little neighborhood park, with a nice fully fenced playground area. The play equipment is a mixture of new and old elements and is set on a mulch surface. It features a play element with slides, crawling tube and rock wall-ish steps, similar to the structure at Madison Park in Falls Church. This yellow structure is heaven for monkey bar lovers (and maybe hell for monkey bar hating moms). My kids had fun trying to move through everything without touching the ground. A smaller play structure sits in the shade of the trees. It looks to be suited for younger kids. There are three sets of swings: 2 regular swings, 2 arm-pump swings, and 2 baby/bucket swings (not pictured). The arm-pump swings were unusual and my kids had fun with them, although they were a little tricky to use. There is a fire truck play piece — it has low-to-the-ground money bars stretching across it. There is also a small play house, a blue whale (dolphin?) rocker seat, a see saw (pictured above), and a tether ball court outside the play area. There is a porta-potty just outside the fence of the playground (pictured on the left). 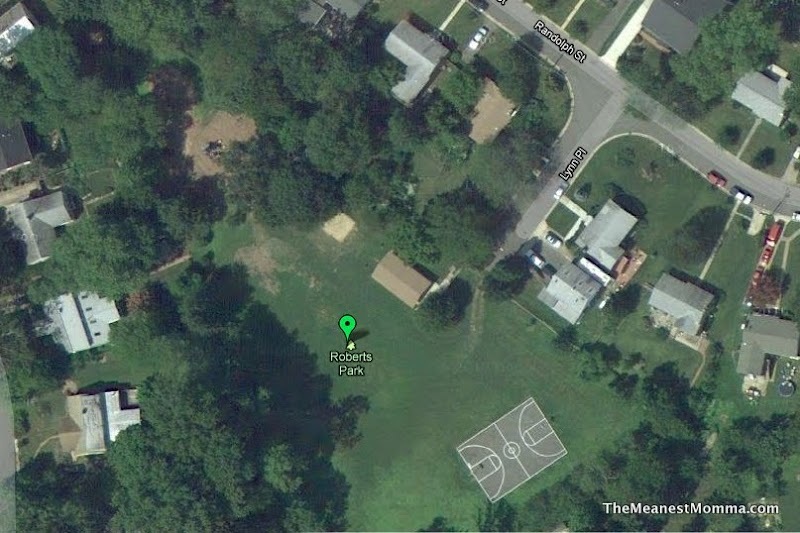 The park also features a large covered pavillion, open grassy area, charcoal grills, and a basketball court. All in all, this was a great find. 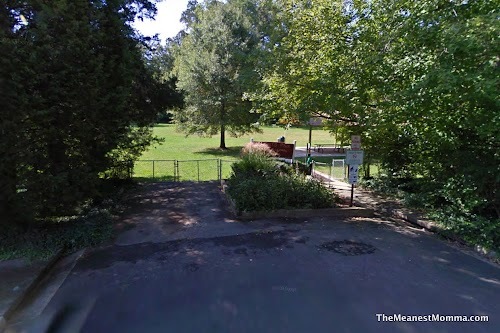 We visited in the afternoon, so I can’t speak to the morning sun situation, but the playground is surrounded by trees and some elements should be shady at any given time. We had a great time here and I would recommend this park to others. I live right down the street from Roberts Park and go there all the time with my 9 month-old son for the baby swings. It’s never crowded, but there are usually at least a handful of children and parents on nice days, which is perfect. It’s such a lovely little hidden Falls Church gem! thanks for the intel — I updated the listing! Do you know if there was on-street parking available?